Mission: Impossible – Rogue Nation is the fifth film in the Mission: Impossible franchise. Not many series can say they’ve reached a fifth film, and even fewer can deliver the way Rogue Nation has. The film is a constant thrill from start to finish, with beautifully pieced together action and consistent suspense. The sequence I’m sure everyone has seen in the marketing, featuring Ethan Hunt (Tom Cruise) dangling from the side of the plane, is a spectacular scene, but is merely that; a scene. While grand in scale and wonderful to look at, the stunt plays no role in the plot of the film and rather serves as something to wet the viewer’s appetite for more. The real story begins as Hunt and his fellow IMF agents out of commission. CIA boss Alan Huntley (Alec Baldwin) is the main component of the shutdown, citing damage from “Ghost Protocol” to support the decision. In doing so, the CIA absorbs any remnants of the IMF, including two of Ethan’s former team members William Brandt (Jeremy Renner) and Benji Dunn (Simon Pegg), as well as bringing Luther Stickell (Ving Rhames) back into the fold. Hunt is on the run, searching for what is referred to as the Syndicate, which has been committing numerous acts of violence and causing civil unrest around the globe. 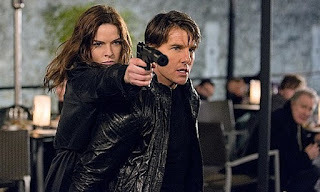 Hunt’s mission (should he chose to accept it) is to take down the Syndicate with the help of British Intelligence agent Ilsa Faust (Rebecca Ferguson). Simon Pegg is given a beefier role this time around in his appearance as Benji. While previously the comic relief computer whiz, Pegg settles into the role of a necessary and surprisingly courageous member to the team. Renner and Rhames still get their moments to shine but are merely there for support this time around; especially when compared to Pegg’s role. Ferguson is a welcome addition to the franchise. As Ilsa, one never truly knows if she is friend of foe; except for Hunt who trusts her completely. A series of actions will lead you to believe one way before turning what you thought right back around as only a true spy film can do. Tom Cruise is, once again, quite good in his fifth time around as the IMF agent. It’s become one of his more signature roles and after a few lackluster, riskier vehicles outside of Mission Impossible, its clear the franchise is a comfortable home with Cruise at the helm. His continued insistence on minimal green screen and doing his own stunts provide a dose of reality to the film. Behind every evil organization has to be a leader. The Syndicate has one in Solomon Lane (Sean Harris), a man so jaded by past association with espionage that he confuses salvation with destruction. The film acknowledges that there are always men like Lane, just waiting to bring forth their bigger and better plan. Every new installment has featured a new director, but this is the first to written and directed by the same individual. Chris McQuarrie, by accomplishing both duties, gives the film a more unified appearance as the drama is sustained throughout the rather lengthy runtime. While not as stylized as previous directors, what lacks in visuals are made up for with his screenplay. 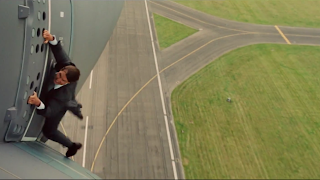 Rogue Nation is able to craft a complex story without becoming overly complicated as well. Of course one can't simply ignore how amazing each action set piece is. From the opening scene talked about above or the simple yet intense scene in the opera house to the extended car chase in Morocco, every action scene plays into the story very well and is beautifully shot.